Since this is my first post of 2012, I must begin by wishing all Soult’s Retail View readers a very Happy New Year! Thank you to everyone who has commented, emailed, tweeted or visited during 2011, and I hope you will find many more posts to spark your interest during 2012. As we enter 2012, the retail picture for the centre of Newcastle looks like repeating the trends of the last couple of years: various high-profile casualties amid one of the most challenging economic environments modern retailers have seen, countered by some exciting new arrivals and major retail schemes. So, in the year ahead, what are some of the most significant things to look out for in Newcastle’s prime shopping locations? 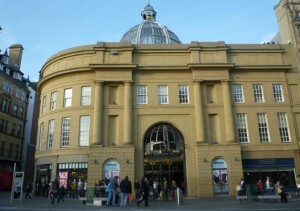 As I reported last week, the opening of the new BHS store in Newcastle’s premier retail location of Northumberland Street, expected sometime in the spring, will be one of the city’s major retail events of 2012. Local shoppers who are yet to experience one of the chain’s new-concept stores – such as the shop in Swindon that I visited in September – will be in for a pleasant surprise when the new four-storey store opens its doors in the old Next premises. 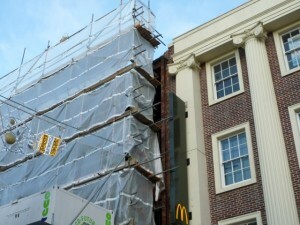 Beneath the scaffolding and wrap – which, as I noted previously, is due to come down in March – it’s just possible to see how the old façade has now been completely removed (below), ahead of the new BHS glass frontage being inserted. 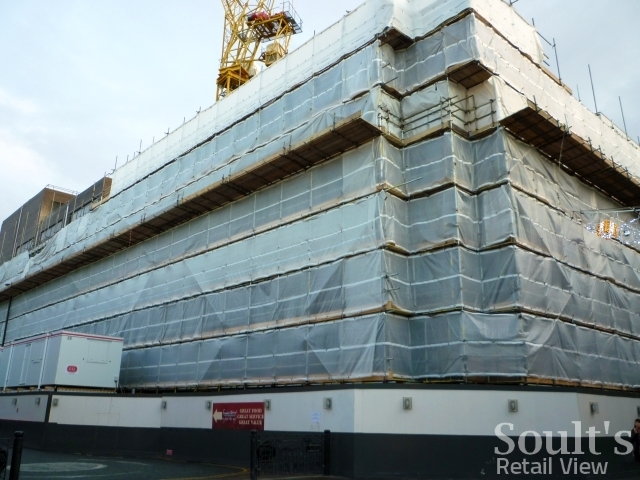 Next door, work to enable Primark’s expansion into the former BHS unit is also well underway, and, together with the new BHS, seems to be keeping local scaffolding companies busy (below). 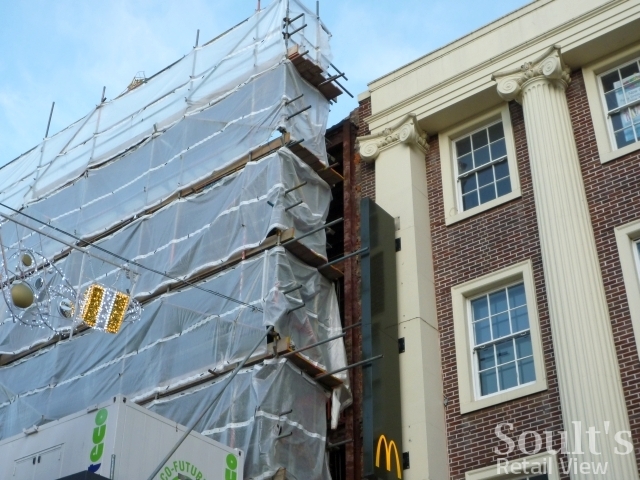 I understand, however, that we will have to wait until the end of the year for those works – which include another revamped frontage – to be completed. 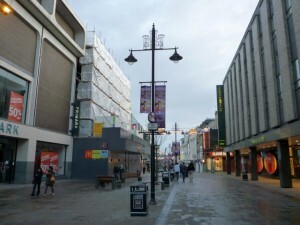 Elsewhere in Northumberland Street, the absence of any currently empty units means that new happenings in 2012 are likely to be the result of rebrands, relocations or closures. 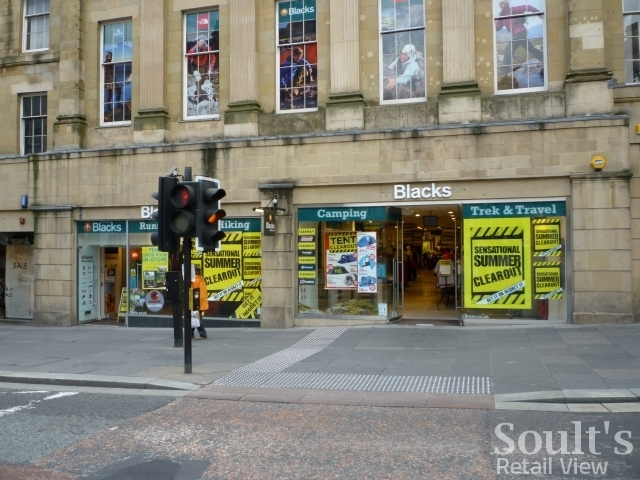 In my previous post, I highlighted one major Northumberland Street retailer that’s looking to exit its existing store, ahead of a relocation to smaller premises elsewhere in the city centre. 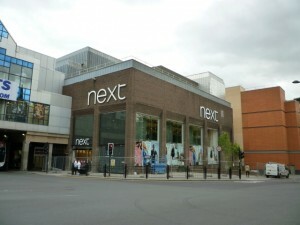 Its situation – being tied into expensive space that is now regarded as significantly overrented – is far from unique; however, with the St Andrew’s Way extension to Eldon Square (and the subsequent shuffling of other retailers, such as Next, BHS and Primark) having mopped up much of the demand for MSUs (major space units) in the city, I understand that finding a replacement occupier is proving a challenge. 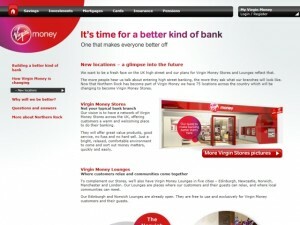 As far as rebrands are concerned, Northumberland Street’s Northern Rock branch will no doubt be rebranded as Virgin Money during 2012; though banks tend to fall outside my blogging remit, it’s interesting that Virgin Money is referring to the locations it has acquired as ‘stores’ rather than ‘branches’, seemingly drawing inspiration from the best of retail as it seeks to create a “bright, relaxed, comfortable environment to come and sort out money matters, quickly and easily”. To complement its ‘stores’, there are also set to be Virgin Money Lounges in five cities – Edinburgh, Newcastle, Norwich, Manchester and London – providing a “place where our customers and their guests can relax”; it’s not clear, however, whether Newcastle’s promised Virgin Money Lounge will occupy one of the city’s two existing branch sites or new premises elsewhere. In Manchester, I’m told that the soon-to-open Virgin Money Lounge has taken over entirely new landmark premises, in addition to the established Northern Rock branch nearby, so it will be interesting to see whether the same approach is taken in Newcastle. 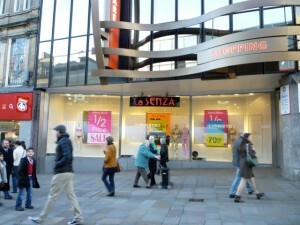 On the closure front, La Senza looks set to be Northumberland Street’s first retail casualty of 2012, following the lingerie chain’s announcement that it intends to enter administration. While the firm has blamed “trading conditions in La Senza’s high street locations and the overall macro environment which are having an adverse effect on the company”, such a statement fails to explain why La Senza has failed when many other retailers are successfully weathering the storm. One suggestion, based on what my female friends have told me, is that La Senza may have fallen into the same trap as the collapsed young fashion chain Jane Norman by undermining its reputation for quality and, by extension, customers’ overall value perception of its products. Of the retailer’s 146 UK stores, Newcastle is one of 81 locations that have launched ‘closing down’ sales, though there’s always a chance that any potential rescuer might decide to keep the store open after all. 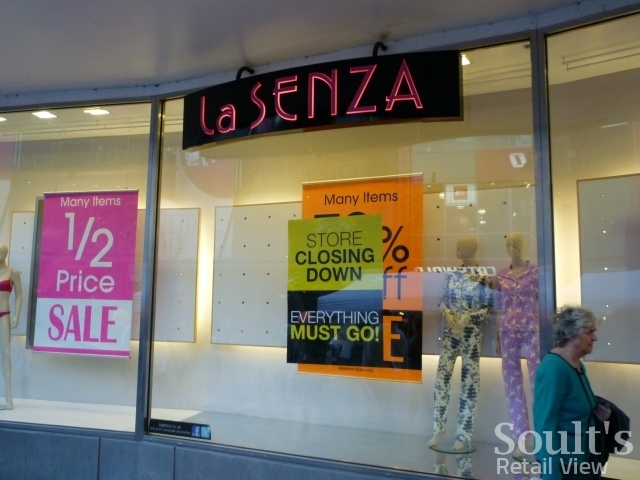 However, given its prominent location at the main entrance to Eldon Square, it’s unlikely that the unit would remain empty for long even if La Senza departed. Elsewhere in the city centre, the fate of several familar stores rests on whether their owners can turn around a sustained period of poor trading. The future of the outdoor retailer Blacks – which has a recently-opened store in Market Street – remains up in the air, while HMV has an uphill struggle to define its place in a changing entertainment market. HMV’s Newcastle store, for example, is a curious mix of technology products, cold drinks and NUFC merchandise alongside the traditional CDs, DVDs and games; the overall impression is of a store that is cluttered, lacking in personality, and confused about what it’s trying to be. HMV’s future – if it is to have one – must surely be in showcasing its credentials as a chain that lives, breathes, and is an authority on entertainment, as a way of differentiating itself from its online and supermarket competitors. However, the current presentation of piles of DVDs in a sub-supermarket-quality environment merely demonstrates the scale of the challenge ahead, rather than any sense of passion for the product. Time will tell whether my shot of a shuttered HMV on New Year’s Day, above – one of the few days of the year when most shops still close – becomes a more poignant image in the coming months. 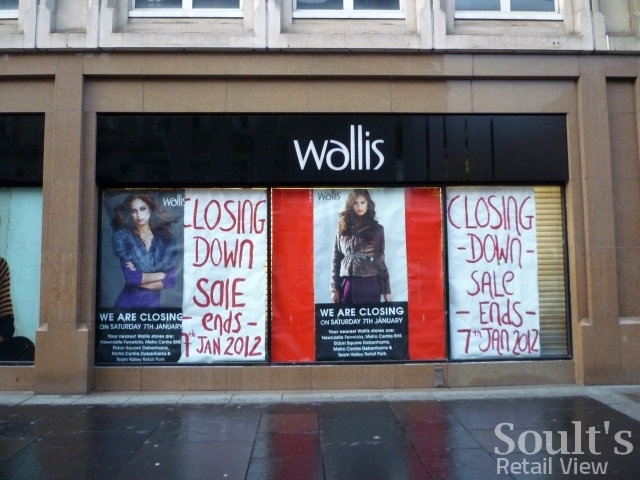 Further down, on the corner of Northumberland Street and Blackett Street, the closure of the Wallis and Evans store in Monument Mall this coming Saturday (7 January) is, hopefully, the harbinger of more positive developments ahead. Hammerson – who bought the shopping centre last April – had its ambitious plans to redevelop Monument Mall approved in November, and the Arcadia brands’ departure is a necessary step in enabling the scheme to proceed. Some high-profile departures under the previous ownership left Monument Mall’s generally small-sized units bereft of occupants, and Hammerson’s plans turn the centre inside out by filling in the mall’s circulation spaces and creating full-depth, street-facing shop and restaurant units. While Arcadia’s decision not to open new Evans and Wallis stores in Newcastle is a little disappointing, the move is in line with Sir Philip Green’s strategy of consolidating his space as leases expire. 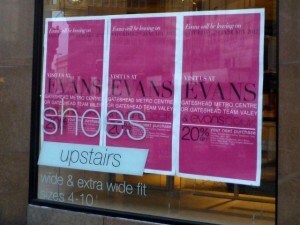 As the store-closure posters note, Wallis already has concessions in Newcastle’s Fenwick and Debenhams stores, while Evans is represented at both Metrocentre and Team Valley in Gateshead, but not elsewhere in Newcastle. 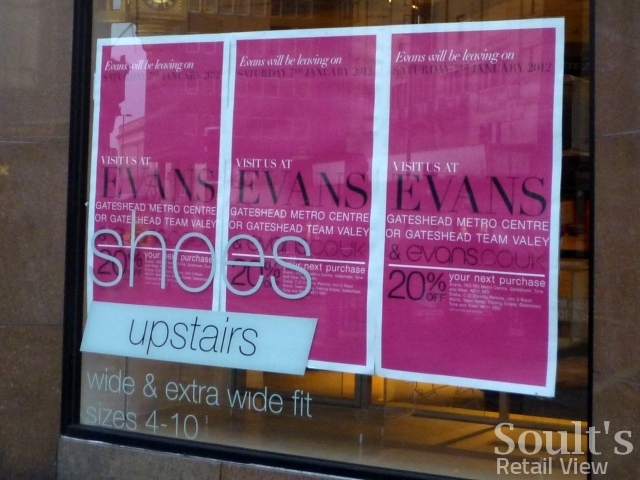 Of the two, I’d therefore wager that Evans is more likely to make a reappearance in Newcastle city centre in due course – perhaps even as part of the aforementioned new BHS store – given its distinctive plus-size positioning and lack of Newcastle presence once the current store closes. 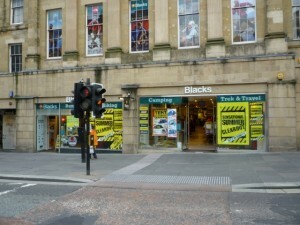 Incidentally, the only impact of the plans on the Peacocks store – which opened in the former Zavvi unit in 2010 – will be to block up its current mall entrances, leaving the main Northumberland Street frontage as the only access. The store will therefore revert to being the self-contained premises that it used to be as Woolworths and Next, in the years before Monument Mall opened in 1990. So, what of the Monument Mall development itself? 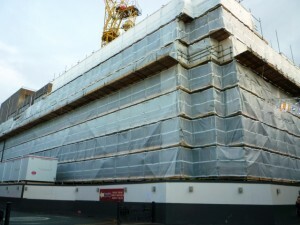 My understanding is that the new units are likely to be trading in time for Christmas 2013, and that Hammerson’s focus is on attracting niche retailers that will complement and reinforce the emerging Urban Outfitters-anchored high-end cluster around Grey’s Monument. With strong demand for the medium-sized units in the new scheme, I understand that the development is expected to be fully let by spring this year. 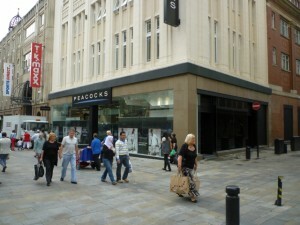 While no names have emerged, Hugo Boss – recently beaten by The North Face to the former Schuh unit opposite – must be a prime candidate, while there are plenty of expanding high-end fashion brands, such as White Stuff and Jack Wills, that are yet to establish a Newcastle presence. 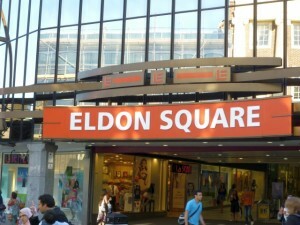 The dominance of Eldon Square within Newcastle is, arguably, one of the reasons why the city centre’s smaller shopping malls – whether Monument Mall, Eldon Garden or the earmarked-for-demolition Newgate Shopping Centre – have consistently failed to fly. 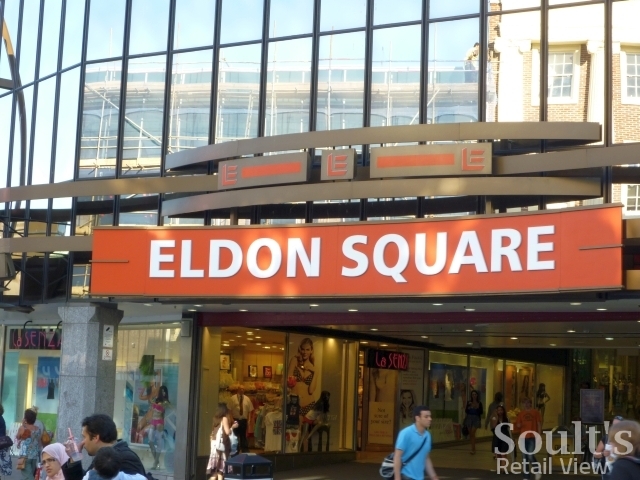 With 150 stores, Eldon Square’s vast size leaves it vulnerable to retail collapses, with the existing Barratts, Priceless and Past Times stores all at risk from those chains’ current difficulties. On the other hand, the shopping centre still has an impressive occupancy rate and a successful record of refilling those units that have recently become free. While I understand that one retailer is mulling an exit, the new Debenhams-anchored St Andrew’s Way remains fully let to date, and almost all the space freed up by relocations to the new mall has been reoccupied by other tenants. Most notably, of course, Next opened a new flagship store in the former Arcadia space in May last year, which I’m told is trading very well. The major problem area of Eldon Square is the Sidgate and High Friars stretch, running between the new Next and the mall entrance next to Grey’s Monument. Traditionally more value-focused than the rest of Eldon Square, this part of the shopping centre has suffered from its odd configuration and small-sized units, and currently has a relatively high number of voids, including the large two-storey store that New Look vacated when it moved to St Andrew’s Way two years ago. However, my understanding is that the key former New Look unit will soon be reoccupied by a big-name retailer moving from elsewhere in the centre, whose space, in turn, is set to be occupied by a fashion chain not currently represented in Eldon Square. Ahead of any more radical reconfiguration of Sidgate and High Friars (which is surely likely to be required at some point in the future), the reoccupation of the former New Look site will at least restore some of the footfall that has been lost in the last couple of years. So, for all that the media likes to portray 2012 as the year of a “high street bloodbath”, the reality in Newcastle city centre is more complex – and more positive – than the garish headlines suggest. 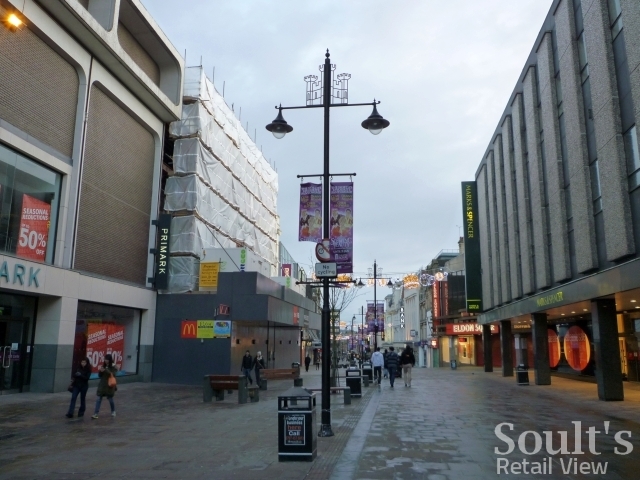 With both new and existing retailers still making significant commitments to the city centre – and, on the whole, decent demand for any space that becomes free – Newcastle seems well placed to see through the downturn and emerge in good condition on the other side. If I recall correctly, at least some of the units will be multi-level, which should address that! I suppose the revamp of Monument Mall (as described) will also close one of the entrances (perhaps the ‘least known’ one) to Fenwicks Department Store? The new basement plan that I’ve seen shows what looks like a very convoluted route connecting Fenwick with Monument Metro, but I haven’t quite worked out how it all works on the ground! Great article Graham and totally agree with your comments regarding HMV. 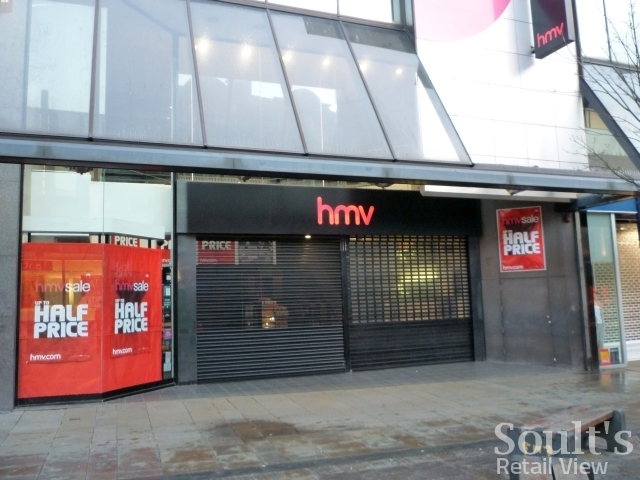 As a massive music fan and someone who used to work in a record shop I would hate to see HMV disappear from the high street, but the impression I get from their stores is of a retailer without direction. Yes, music sales are falling but there is no reason why they can’t be successful. Stores such as Rise (in Cheltenham and elsewhere), and FNAC in Paris prove that well merchandised, well designed, well stocked entertainment stores can work. Rise in particular is a great shop for the serious music fan and also has an extensive vinyl section – given that vinyl sales are on the increase I think HMV are missing a trick here as few of its stores stock it. 2012 will certainly be an interesting one for retail in Newcastle and elsewhere. Another really interesting piece as ever Graham. Looking forward to seeing what 2012 brings for Newcastle.